There are several important points to keep in mind when you go to mix your nutrient solution. There is a specific order to add nutrients to the water and you need to be able to adjust the strength and pH of the solution. This article covers how to mix nutrient solutions that have the correct Nutrient Element Ratio (NER), are the correct strength as measured by EC, and have the correct pH. To mix proper nutrient solutions, there are several things that matter! Nutrient Element Ratio (NER) Matters: Cannabis plants do best when given the correct ratios of nutrients. These ratios change during the course of the grow. Supplier feed charts allow you to get the correct NER. 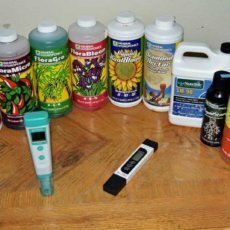 See our article, "Cannabis Fertilizers, Supplements, and pH". Electrical Conductivity (EC) Matters: EC is a measure of the salinity of the water. It essentially is a measure of the overall strength of the solution. If the EC is too high, the plant cannot drink water and will show symptoms known as “nutrient burn”. Following supplier feed charts produces solutions that are too high in EC. See "Understanding Osmosis and EC". Order Matters: Adding nutrients in the wrong order can create lock out, which leaves the nutrients unavailable to the plant. pH Matters: The pH of the solution affects the solubility of the nutrients. If the pH is out of the recommended range then certain nutrients will not be available to the plant. This hybrid Article/Tutorial will explain the key factors involved with mixing nutrient solutions and provide specific instructions for how to create your own nutrient recipes and mix your own solutions that have the correct NER, EC, Order, and pH. As we explain in “Principles of Fertigation”, you always need to remember that fertigation requires a balance. You need to mix nutrient solutions that have the correct Nutrient Element Ratio (NER) and the correct Electrical Conductivity (EC). The only reasonable way to ensure the correct NER is to follow the supplier feed charts. All nutrient suppliers should provide a feed chart, and most of their published feed charts are specific to cannabis plants. Unfortunately, it isn’t quite so simple as that. If you follow nutrient supplier feed charts exactly, you will produce a solution that is way too strong in terms of EC. We measure EC to make sure that the nutrient solution isn’t too salty. If water is too salty then plants cannot drink it and it can lead to dehydration even as they sit in water, just as you would dehydrate while drinking seawater. 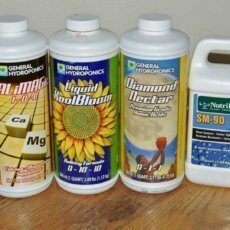 To learn more about NER and Cannabis Fertilizers, read our article, “Cannabis Fertilizers, Supplements, and pH”. To learn more about the importance of EC, read “Understanding Osmosis and EC”, and to know what EC you should be aiming for, be sure to see our tutorial, “How to Set EC Targets”. Why do nutrient suppliers create recipes that are too strong? Nutrient suppliers expect you to mix those doses to achieve the correct Nutrient Element Ratio (NER) and then to dilute the solution to arrive at your target EC or PPM. Therefore, they provide both recipes for NER and separate EC or PPM guidelines for strength. The recipes are designed to be too strong because that allows each grower to dilute their solution to their individual target EC; while maintaining the correct NER. If the recipes were weaker than some growers needed, it would be more difficult to increase the strength of the solution without upsetting the NER. Nutrient companies expect you to mix nutrients at the full doses and then dilute the solution until you reach your EC target. However, the base nutrients impact EC the most and many supplements have only a small impact on EC. Dilution reduces all nutrients and supplements regardless of their EC impact. For this reason, you should create your own nutrient recipe, by reducing the quantities of the base nutrients – but maintaining their ratios. This allows you to keep higher doses of certain supplements. Always provide base nutrients at the ratio recommended by the feed chart: For example, if there is twice as much “Bloom” than “Grow” in the feed chart, there should be twice as much in your nutrient solution. The total amounts can vary to achieve your target EC, but the relationship among them should be the same. When considering supplement doses, consider their EC impact: Some supplements, like humic acid, have a negligible impact on EC and they may be given at full the recommended dose. Other supplements, like bloom boosters, make a large impact on EC, and must be dosed carefully. Be sure to read our article, “Nutrient Supplements That We recommend” for a deeper look at supplements. 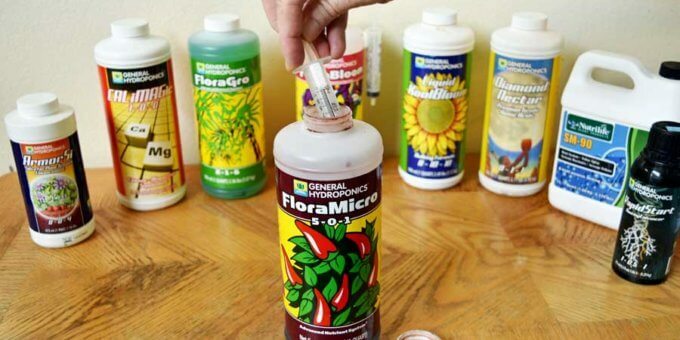 The doses for the base nutrients (Flora Micro, Flora Gro, and Flora Bloom) are about half the dose that General Hydroponics recommends in their feed chart. However, most supplements are at or near their full recommended dose. If you are using this nutrient line, then you can follow these recipes with only minor adjustments to arrive at your specific EC target. As I explain in the tutorial, “How to Set EC Targets”, You may or may not be able to use untreated tap or well water to mix your nutrients. The key consideration is the EC. Starting water must be lower than EC 300. The lower the initial EC the better. Using distilled water or water filtered through reverse osmosis is best. However, tap and well water may be used if they start less than EC 300/0.3. It is important to accurately measure the doses in order to maintain the correct NER. Because of this, when the EC target is very low, as it is during the seedling stage, it is better to mix a stronger blend and then dilute the solution to your EC targets. To accurately measure doses of nutrients I cannot recommend graduated oral syringes enough. I use 10ml oral syringes and they come in a pack of 15. That is more than enough to assign one to each nutrient. They are accurate to fractions of a milliliter and they also read in teaspoons. Nutrients should be added to the water in a specific order to prevent lock-out. Silicon should be added first and given time to dissolve. Cal/Mag is second and should be added before the base nutrients. At the other end, Rapidstart, which has no impact on EC or pH should be added at the absolute end. Rapid start and H2O2 (when used) can be added after the final pH adjustment. To Raise EC: Make a high EC solution to mix with the low EC solution rather than adding nutes individually at the end. To Lower EC: Dilute with “Cal/Mag water”: When dilution is required to reach the target EC, it is best to dilute with “Cal/Mag” water rather than plain water. 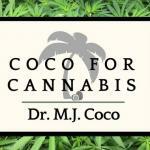 This maintains the full dose of Ca and Mg and avoids potential problems that unbuffered coco may cause. Simply mix additional water with your regular dose of Cal/Mag supplement and use that to dilute the high EC nutrient solution. Precision of your Target: Ideally, EC of your nutrient solution inflow will stay consistent, but it does not have to be precise. You can accept inflow EC values that are within 50 microsiemens (0.05 millisiemens) of your target. The EC within the root zone will fluctuate more than this anyways. However, if it is more than 50 points off target, you should adjust it. The pH of the nutrient solution affects the solubility of the nutrients in the solution. If the pH of the solution that you add is outside of the acceptable range, some nutrients will be unavailable to the plant. 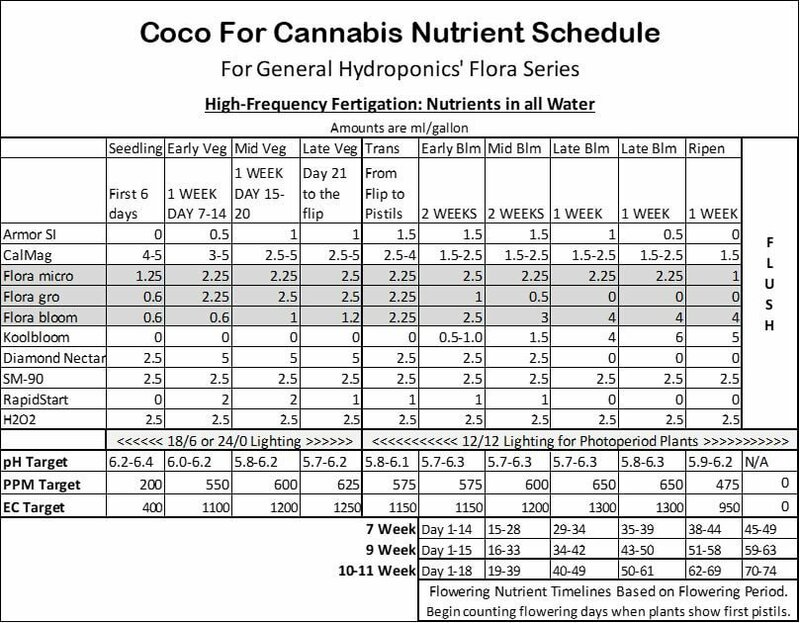 Coco does not buffer the pH of nutrient solution as effectively as soil and therefore it is critical to set the pH of the nutrient solution inflow within the range of 5.5 to 6.5. 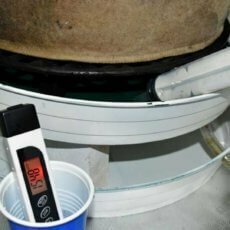 Because different nutrients are soluble at different pH, it is best to allow the pH to drift up and down within the range on successive fertigation events. During the majority of the grow your inflow pH should fluctuate around an average of 5.9. However, during the seedling and ripening phases it is best to target somewhat higher in the range (6.1-6.3). 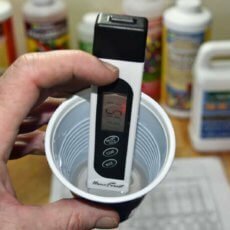 If you have any questions about pH, be sure to see our tutorial, “How to Measure and Adjust pH”. That’s pretty much how I thought accept for the bio bud and weed! Thanks bro ? I only have SI CAMAG and the 3 base nutrients. I do not have the other supplements. Am I going to fail at this? Not to worry, you have the most important stuff! I have grown plants in Coco with only Cal/Mag and the base three. They are enough to go the whole way if that is all you can get. They are certainly enough to get you started. Thanks for the reply Dr. Coco. Following your instruction my nutrient mix (without sm-90) has a EC of 800. Is it too low? If it is, what should I do to raise it? If the EC is too low the best solution is to mix a stronger batch and then blend the two batches together. I cover this in my article “How to Mix Nutrient Solutions“. That said, I am surprised, by that number. How much CalMag are you adding and what stage of the schedule are you? I encourage you to start a journal for your grow in our Grower’s Forum! Hey I cant buy SM-90 in canada because it is a restricted product. I now use RAW Yucca. I have already updated the “Nutrient Supplements that we Recommend” , but I have to update this article too!! !